Swim with Dolphins in Orlando Florida! Swim With Dolphins Here In Florida! Dolphin Tours Around Orlando And Beyond! We as humans have always been fascinated by dolphins, and to swim with dolphins has greatly increased over the years due to the satisfaction we experience while swimming with these graceful and highly intelligent mammals. Swim with your own bottlenose dolphin and experience the power and playfulness, and watch this incredible creature bring joy to all your family. Unforgettable memories will remain for the rest of your life. We promise if you have the chance to do a dolphin tour and come back to swim with dolphins in Orlando or any where else in Florida, depending on the budget...you will! Dolphin tours and parks are widely available throughout Florida, and as you can see from our own adventures at Discovery Cove, to swim with dolphins in Orlando was one of the best moments we have shared on all our visits over the years. Away from Orlando, dolphin swims are in great demand from the gulf coast to the Florida Keys. We've come across loads off people who have decided to stay in Orlando and take a two day break away and travelled down to places like Miami, Key West, and Key Largo. You could also take a day away from the theme parks and if you have your own transport shoot over to the gulf coast which takes around 1-1½ hrs and visit one of the many venues. 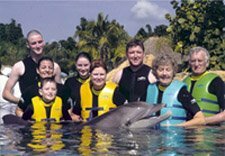 Here's a few helpful links below for information regarding dolphin tours, venues and parks, and if you feel the need and your budget allows to swim with dolphins, then hopefully the information we provide will be of use to you and your family...Personally from all my family, you have to do it and the memories will stay forever! Discovery Cove....A piece of heaven in Orlando, we highly recommend you go if the budget allows. SeaWorld Orlando....If you are lovers of the ocean and everything that lives above and below the surface, this is the park to visit! Dolphin Swim / Dolphin World - Your complete Swim with Dolphin website, Dolphin Swim vacations, Dolphin retail store, Dolphin give away contest and much more. Dolphins Plus....Key Largo's original swim with the dolphins program! Call them today to sign up for the dolphin experience of a lifetime! Miami Dolphin swim....Experience South Florida's range of activities on a 2-Day Miami South Beach adventure. So if you want to try this fantastic experience in Orlando or other venues in Florida, we highly recommend you try, even if you miss a theme park out, you will not be disappointed. We will keep updating this page via our RSS feed. regarding new additions, changes etc, so click onto the RSS feed above and follow the instructions to keep you on top off what's happening in and around Orlando, including swimming with dolphins and dolphin tours.